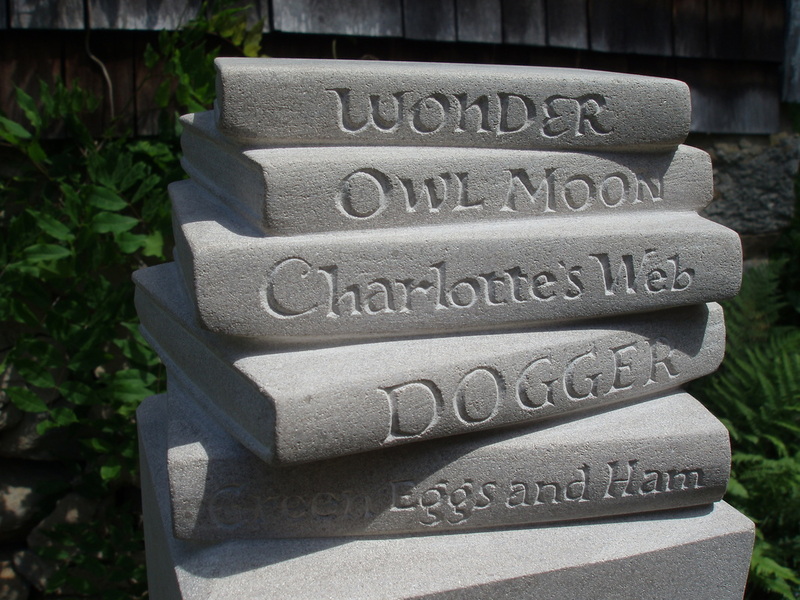 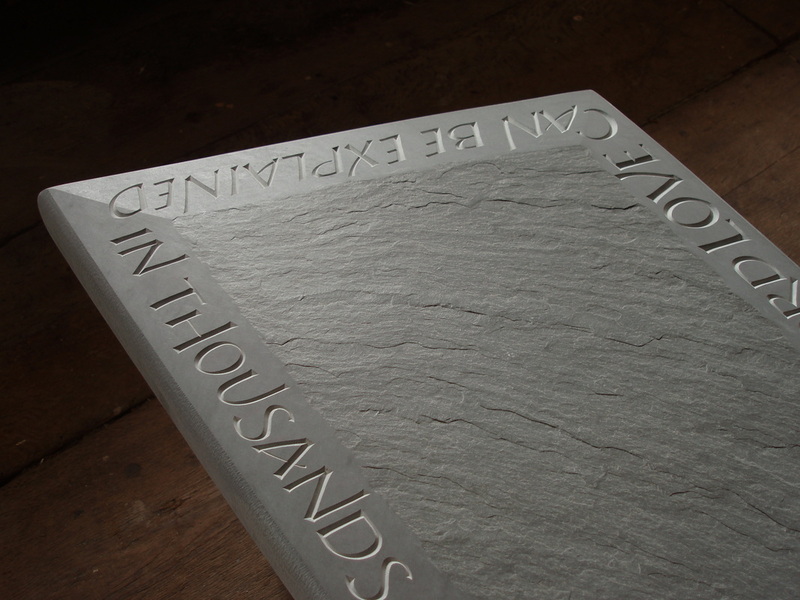 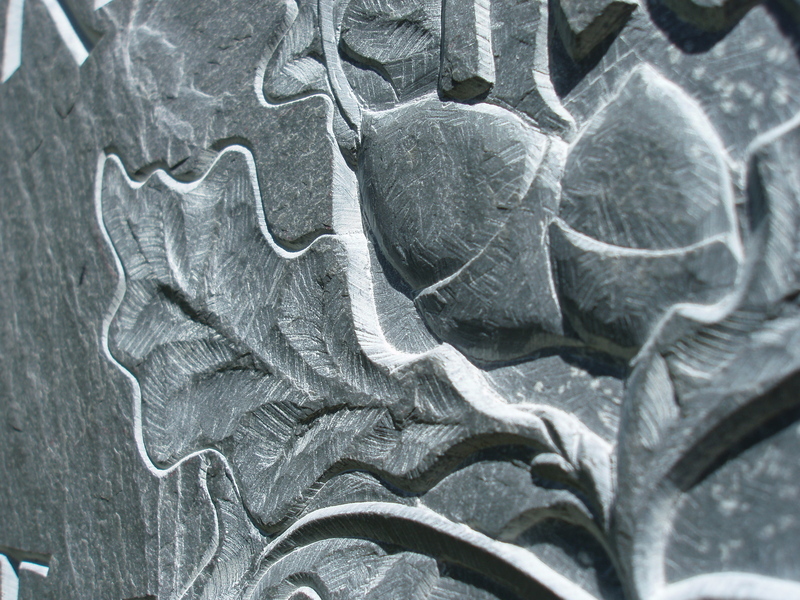 Along with hand carved gravestones, I am also commissioned to design and create commemorative carvings, architectural lettering, garden pieces, water fountains, benches...just about anything in stone! 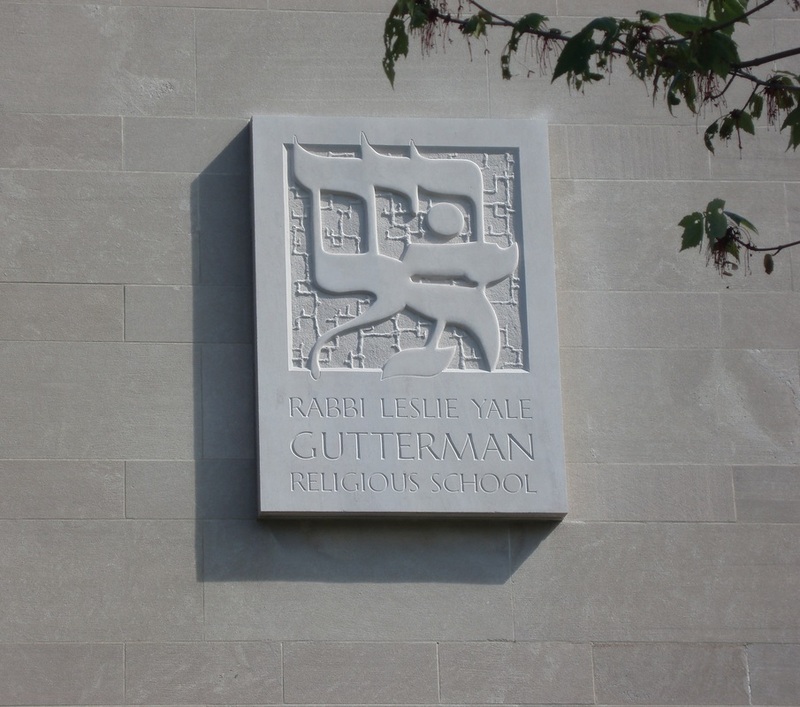 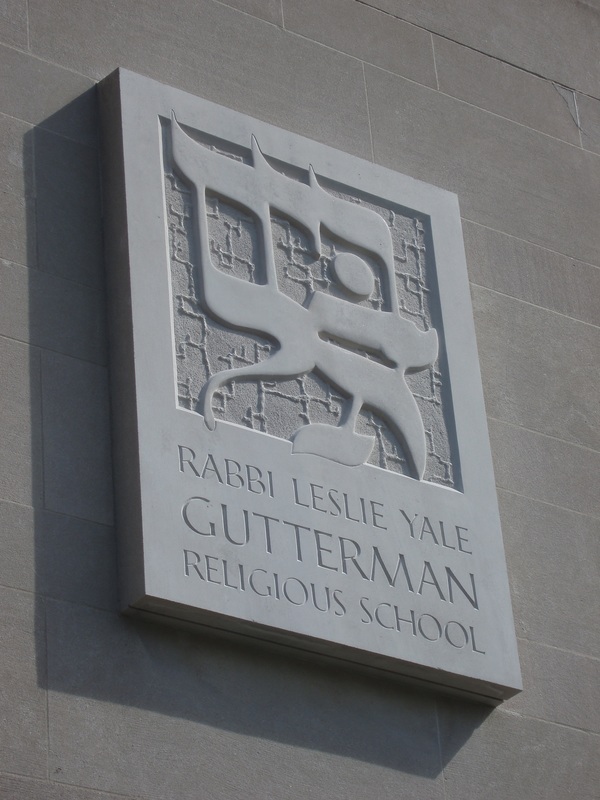 Rabbi Gutterman Religious School Dedication. I was asked to design and hand carve this 7'x5' existing limestone panel to honor the retiring Rabbi and the naming of the school. 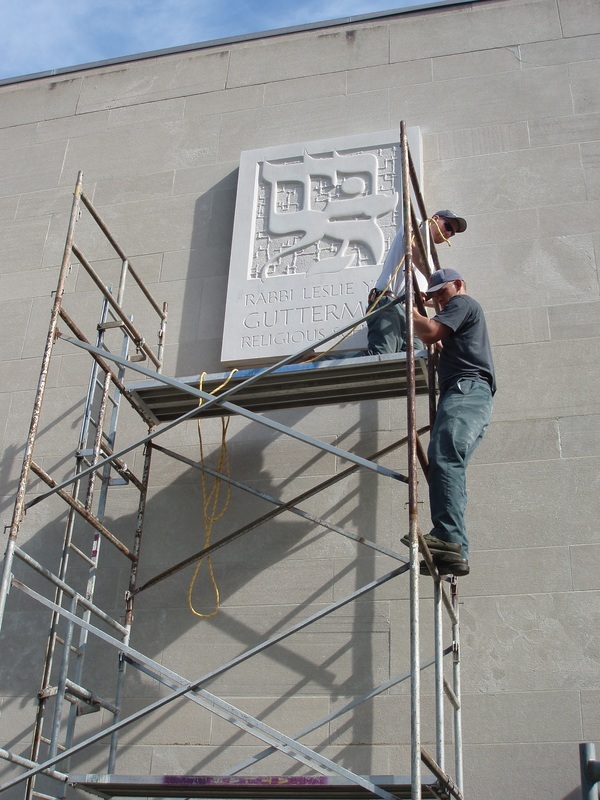 The large Hebrew characters are the logo for the synagogue "Temple Beth-El" in Providence, Rhode Island. 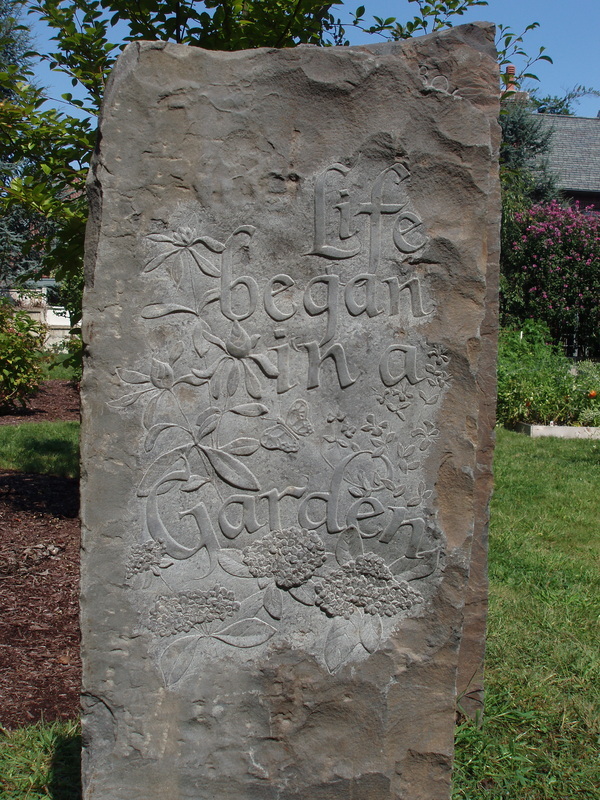 Life began in a Garden." 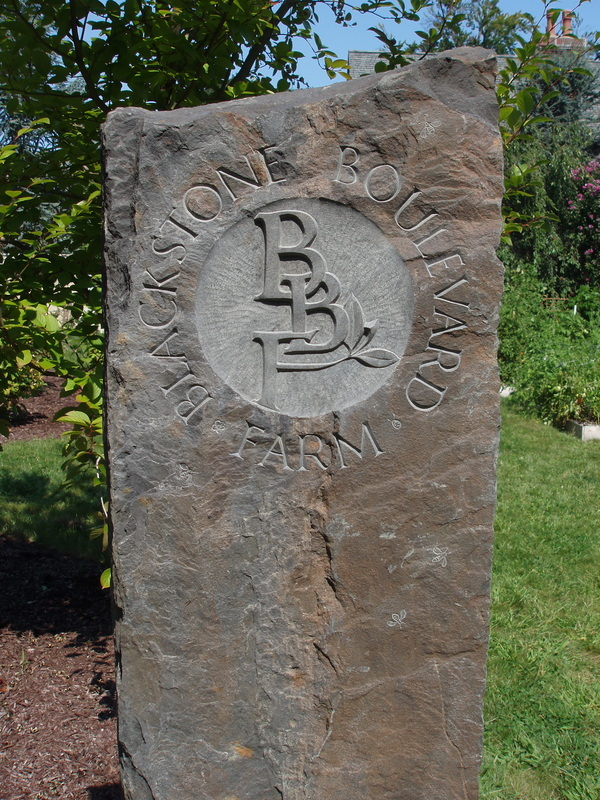 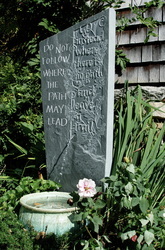 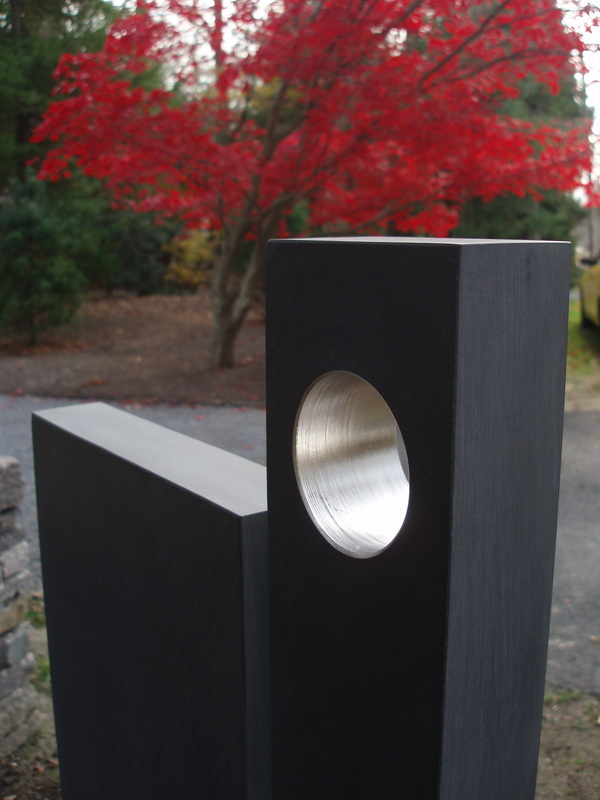 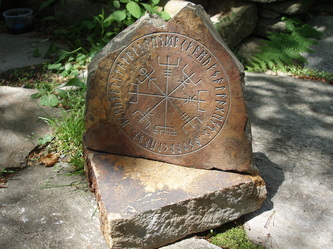 The two standing stones were commissioned for an urban farm in Providence, Rhode Island. 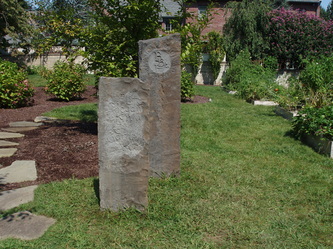 The stone slabs are reclaimed old bluestone curbing that was over 100 years old. They stand around 5' and 4' tall. 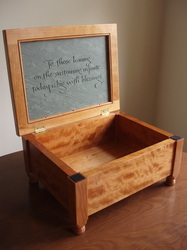 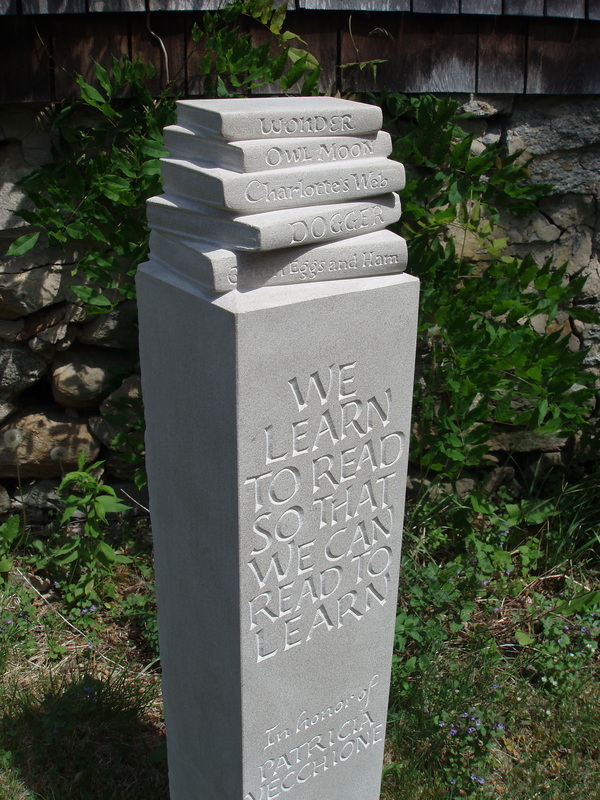 ​"We learn to Read" (quote by P. Vecchione) This piece was commission with a educational grant to honor a retiring teacher after 40 years of service. 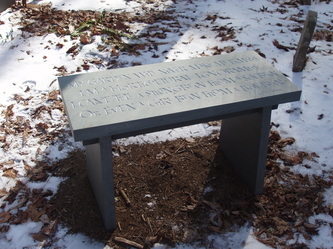 It sits outside of the Winsor Hill Elementary School in Johnston, Rhode Island. 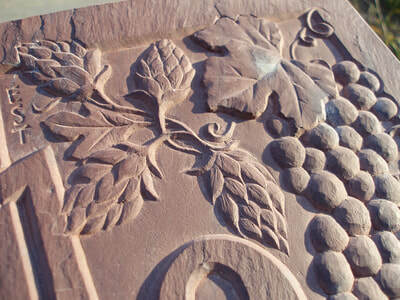 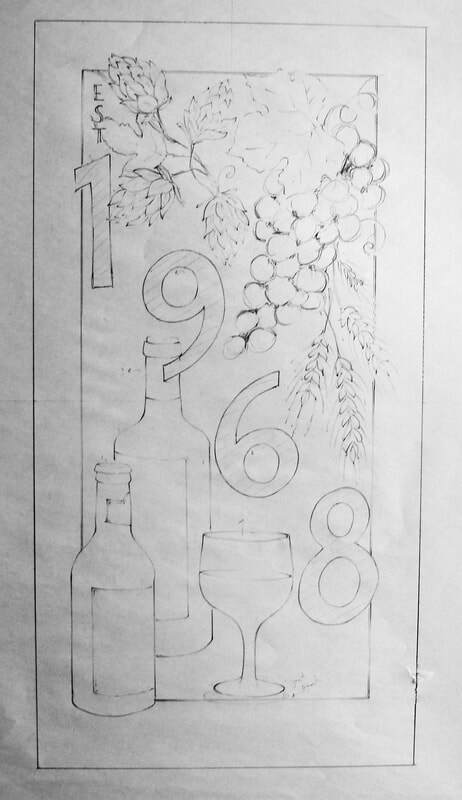 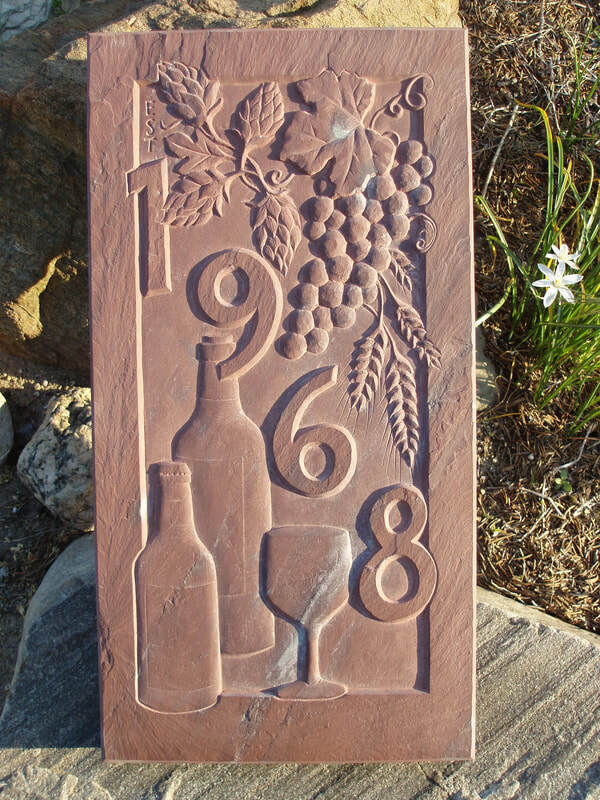 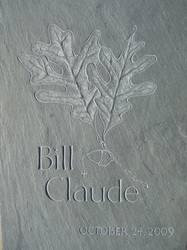 Hand carved Vermont red slate commissioned corner stone for a beer, wine, and spirits store. 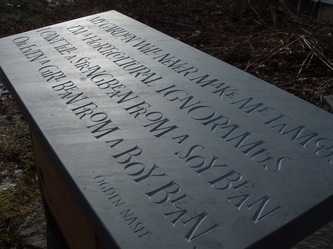 "My Garden will Never Make Me Famous" (Quote by Ogden Nash.) 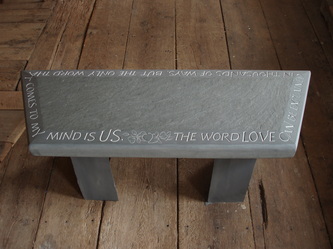 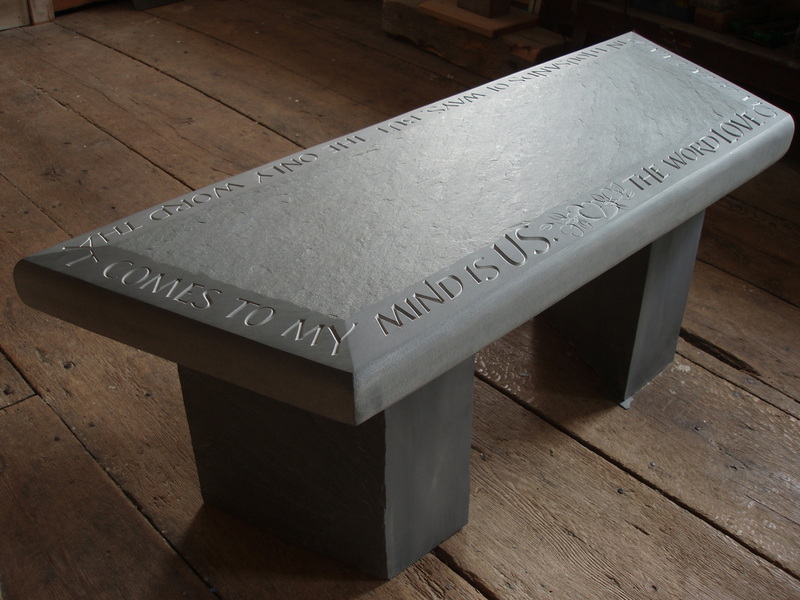 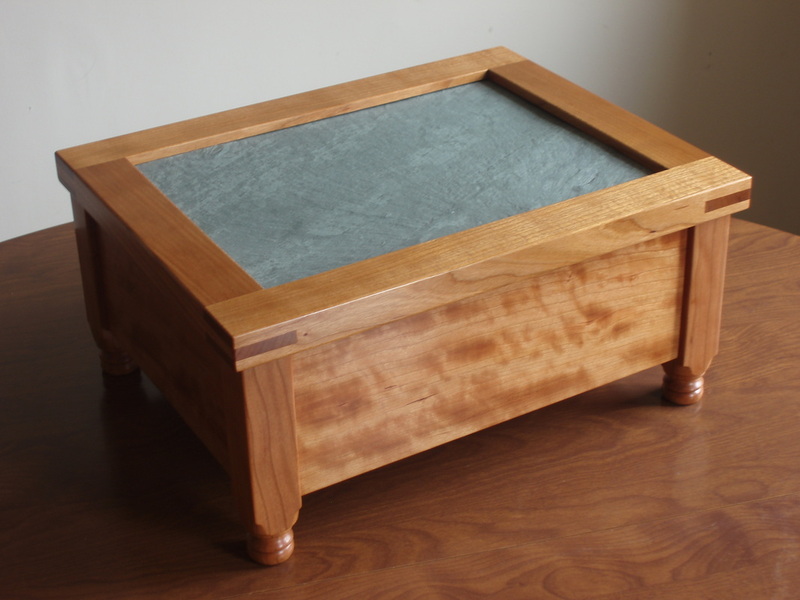 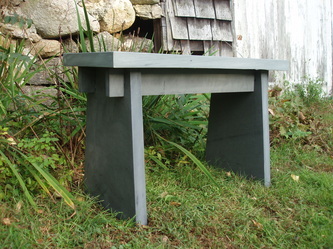 This slate bench is constructed of five pieces of gray slate, held together with joinery, not hardware. 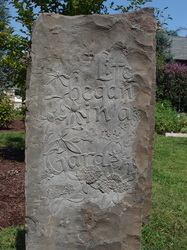 Commissioned for a private burial plot. 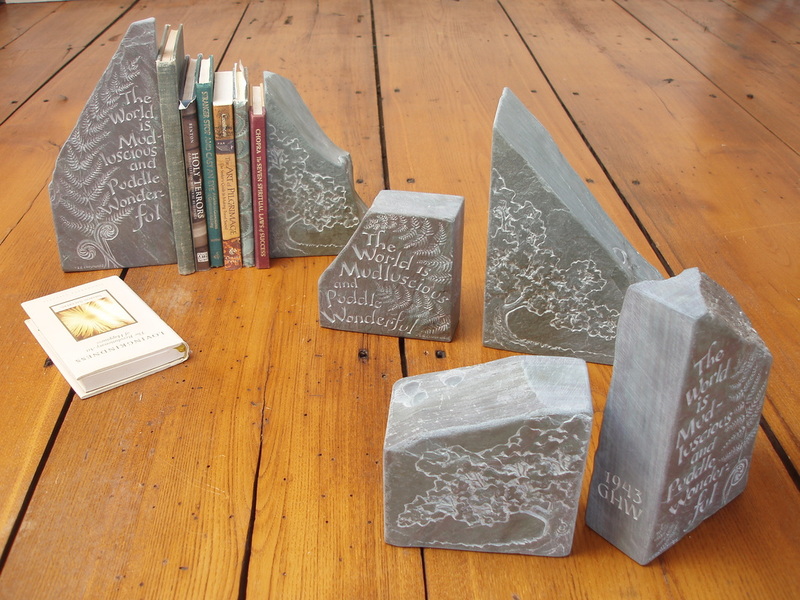 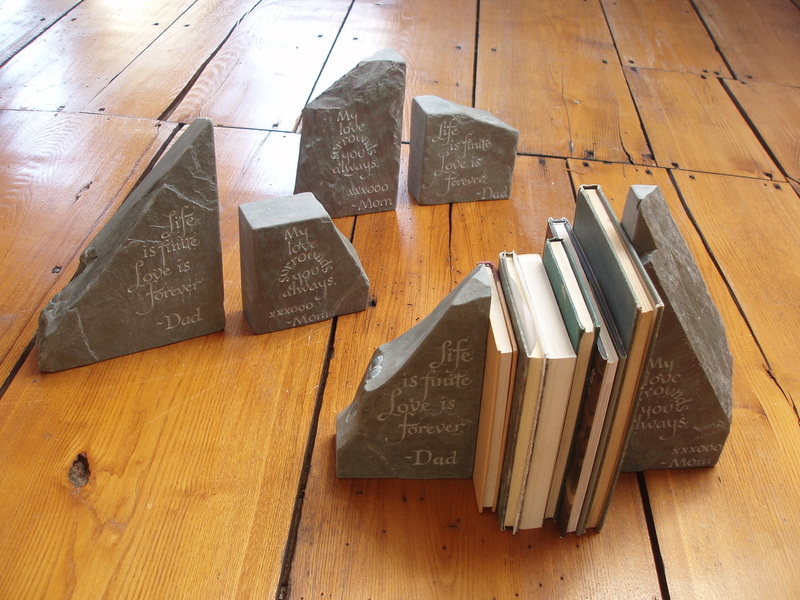 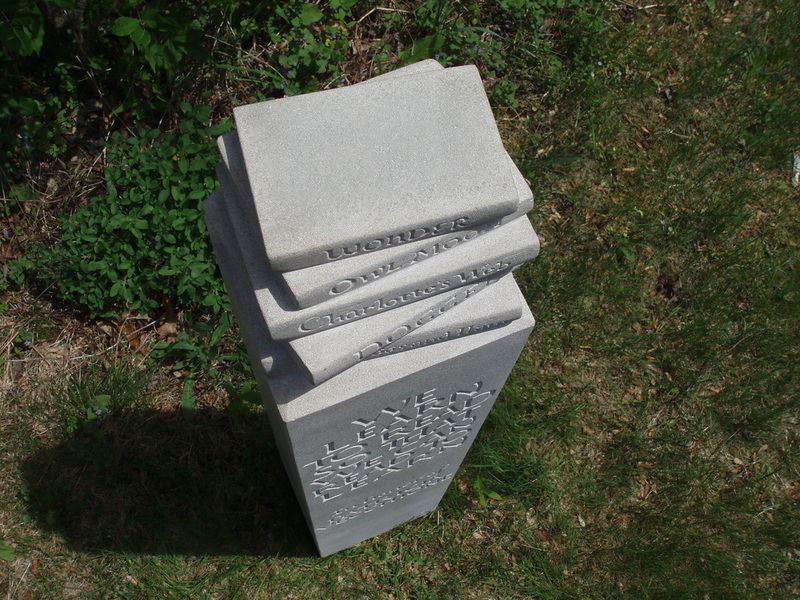 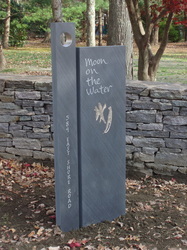 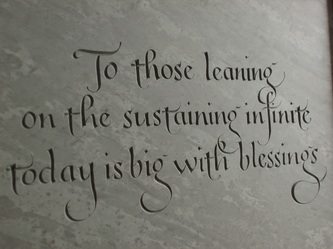 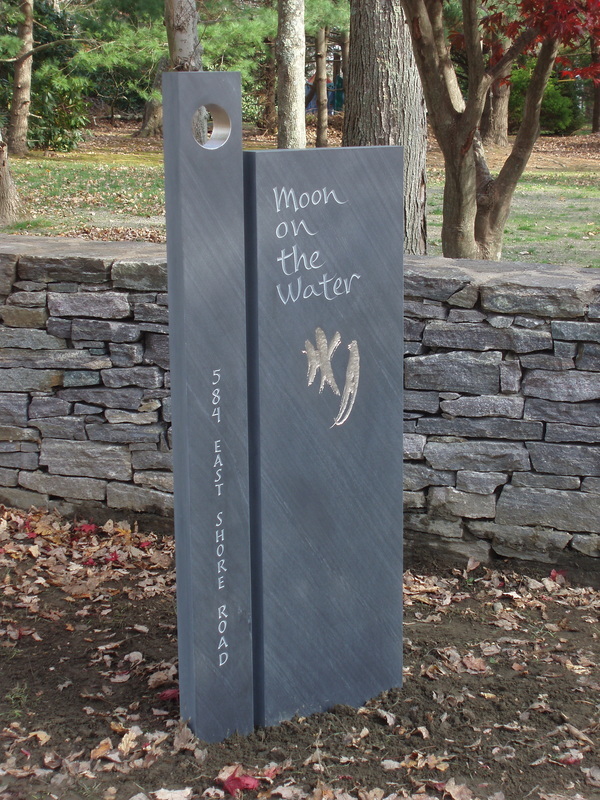 "Memorial Bookends" (quote by EE Cummings) Designed by a Husband and Wife for their three children. 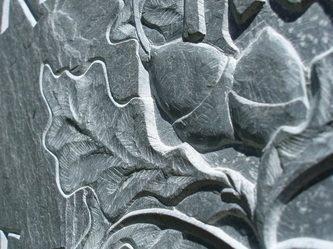 Hand carved Vermont purple/green slate quarry cut-offs. 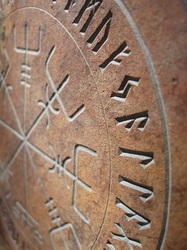 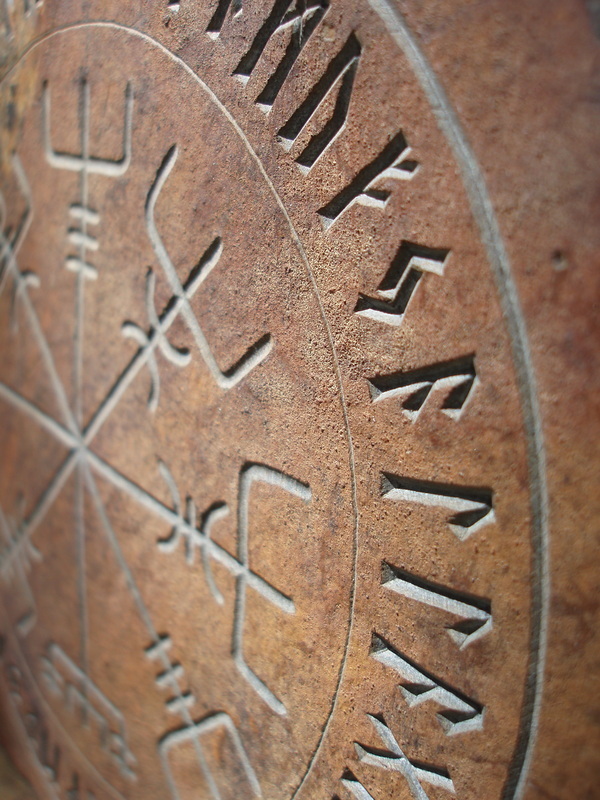 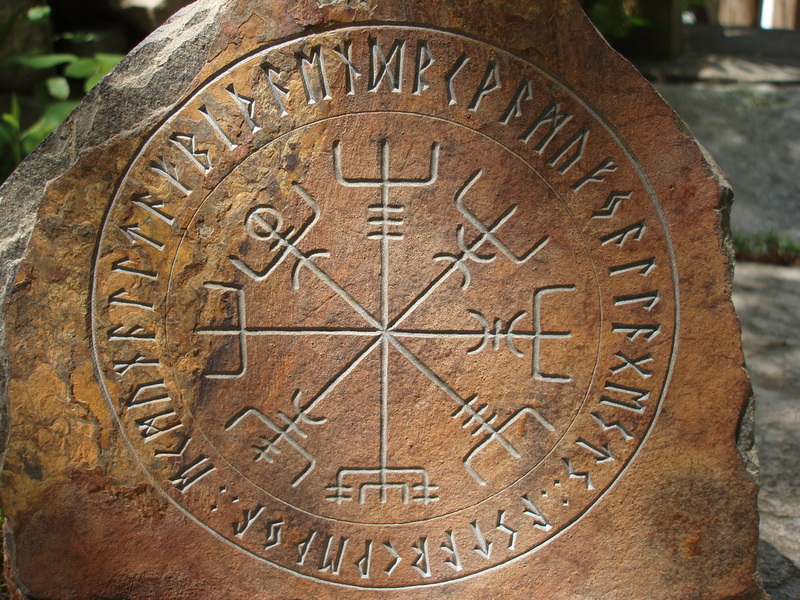 Ancient Icelandic script commissioned as an anniversary gift. A message only between husband and wife. 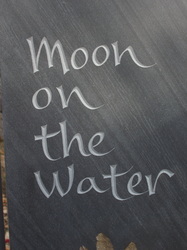 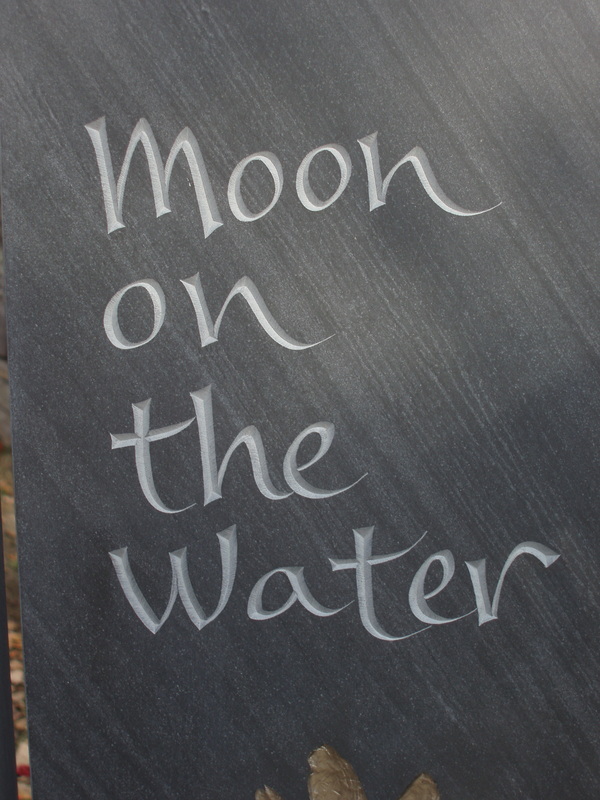 "Moon on the Water" commission to mark and celebrate a new home. 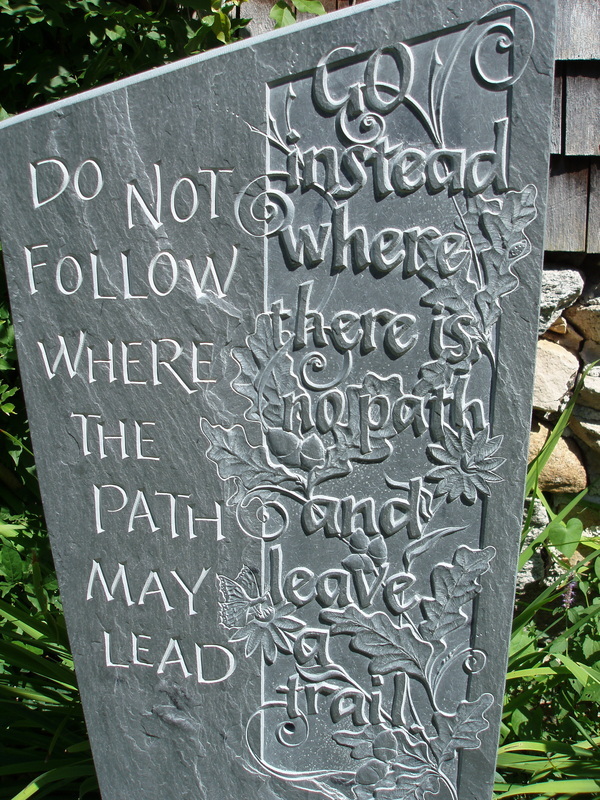 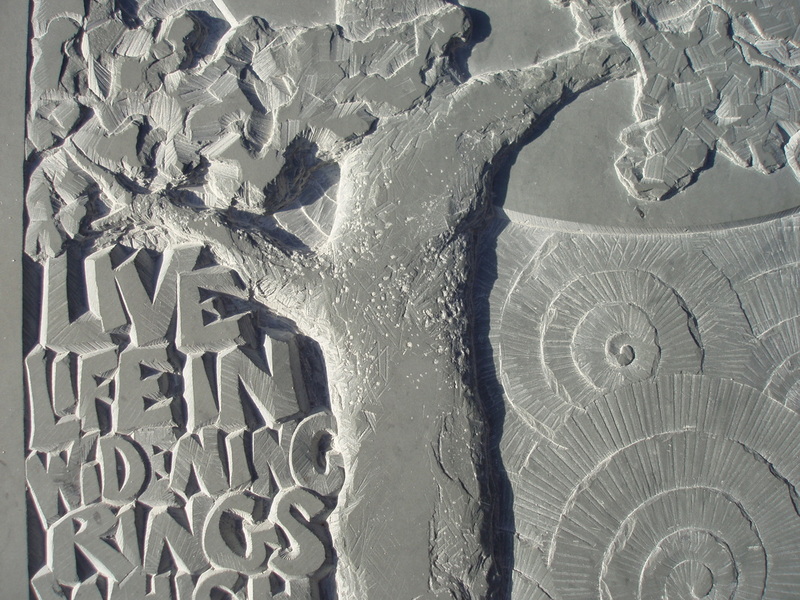 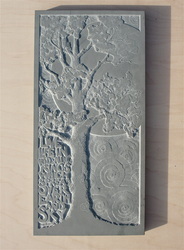 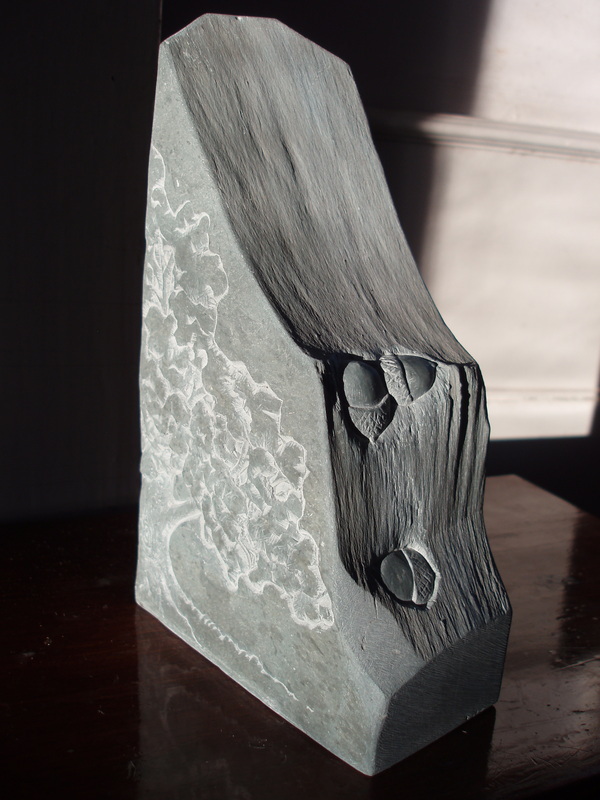 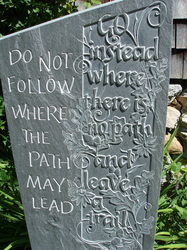 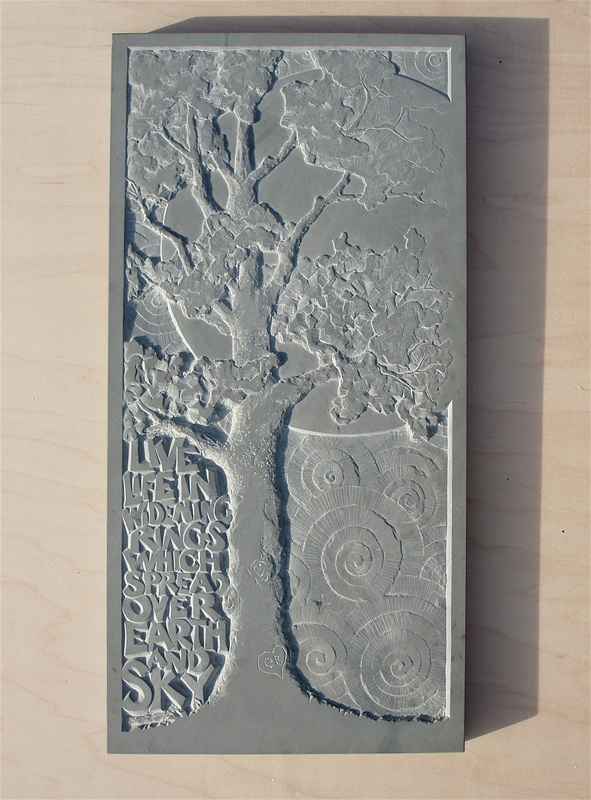 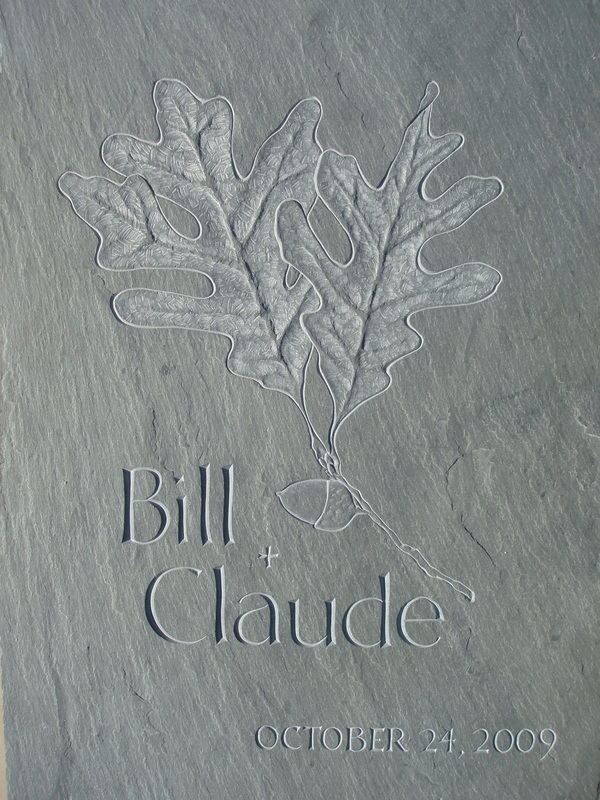 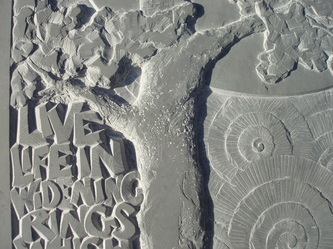 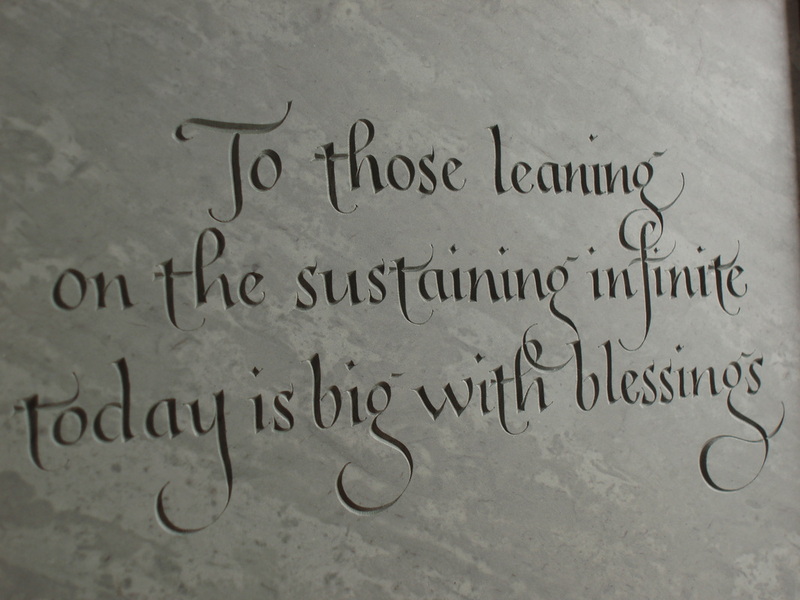 "Live Life" (quote by Rainer Maria Rilke) This originally designed and hand carved piece of Vermont green slate is a wedding celebration gift for the new husband and wife.